Home » Forums » Experiences and Memories » Trip Reports » The Awesome Fouresome take on Food & Wine Festival Pre-Trip! Hi everyone and welcome to my pre-trip! With less than 50 days to go before we set off I figure it's time to get started on the plans! Coming on this particular trip is me Amy 27 (by the time we go) Disney addict with the addiction getting worse as the days pass by officially known as the "Disney travel agent/Disney girl" at work! A title I am greatly proud of! There is also my mam (I'll stay on her good side by not mentioning her age!) also a Disney addict for 20 years I have her to thank for my initial Disney addiction therefore I love her lots! We also have my auntie and uncle on this trip that came with us last year and got the bug of coming to Disney and staying on site! We are also celebrating the occasion that they are both 65 this year not while we are there but I think birthdays should be a yearlong celebration anyway! Here is a picture of the 4 of us! We are staying at our favourite resort of Port Orleans Riverside and really hoping for a mansion building as that's our most favourite location! So onto the plans! Drive down to Manchester Airport and stay overnight in a hotel on the airport grounds ready for the next day! We will probably have a meal at the hotel on the night to pass a bit of time! Get up ridiculously early for a very long day! We have breakfast included with the room so head down for some of that, pack the cars up and take them to meet and greet say bye to Donald (the car) and head in to check in for our flight! We fly at 10.30 and should arrive at 2.30 Florida time! If we arrive on schedule this will be the earliest we have ever landed in Orlando so fingers crossed! Once we land and get through security we will be on our way to the Magical Express to POR! Once we check in and find out room, drop bags etc. the plan is to head down to Disney Springs I am soooooooo excited about Disney springs I can't even express I need to see it in person! We have a free $200 gift card to pick up that we got with our package from the UK. I think we will probably fall into bed because it's always a long travelling day but so worth it! First Disney day only place to go is Magic Kingdom FP for Splash Mountain, Peter Pan's Flight & 7 Dwarfs Mine Train aswell as a Be Our Guest Lunch we plan on hitting EPCOT on the night for food and wine festival! Starting at EPCOT today with FP for Living with the Land, Soarin (first ride on the new version!) and Spaceship Earth we are also going to Hollywood studios this evening but whether we go straight from EPCOT or go back to resort for a bit relax before heading back out is to be decided! We will be staying to watch either fantasmic or the Star wars fireworks but this will depend entirely on how tired we are! Hollywood studios is on the cards for this morning we have FP for Toy Story, Star Tours and Tower of Terror and then we have MNSSHP this night! Just me and mam heading to this as it's not really my auntie or uncles thing they aren't bothered about meeting with the characters or the trick or treating really so for them it's a lot to pull out for fireworks and a parade plus the hocus pocus show is a bit lost on them I don't think they have seen it I WILL fix this at some point!) I'm trying to sort out a Disney bound for me to wear but until I know I can pull the outfit together I'll keep it to myself! I'm soooo excited to do MNSSHP I missed it last year and I was really bummed I didn't do it so it wasn't even a choice this year! We are headed to Animal Kingdom today with FP for Kilimanjaro safaris, Festival of the Lion King and Expedition Everest, we did originally have plans to head to EPCOT for the evening however I found a deal online for something called a magical dining month usually Disney restaurants don't participate but Morimoto Asia and STK are participating this year you get a prix fix menu with 3 courses for $33 which we think is ridiculous good! Seen as we had all admired Morimoto last year we decided to see if we could snag an ADR and we could for this night so it's looking like a Disney Springs night which I'm super happy about! We are headed back to Hollywood Studios with FP for Toy Story, Frozen show and Star Tours then probably back to the resort for a bit relax before Magic Kingdom on the evening I'm hoping to get standby for 7DMT in the dark because I love it! Magic Kingdom on the agenda for the morning with FP for Haunted Mansion, 7 Dwarfs Mine Train and Winnie the Pooh we also have lunch at Be Our Guest seen as it is one of our favourites! We are heading to EPCOT on the night because one of my favourite artists (and future husband!) David Cook is playing in the Eat to the Beat concerts! I'm so excited! At the moment I'm picking up my hire car for the next couple of days (Drivers beware!) so daytime is pretty much shopping whether that is at the outlets or Walmart is to be decided but I think it's fair to say the credit card may want to cower in a corner one way or the other! On the night I'm heading down to Disney Springs solo (don't know what the rest of the family are doing!) for tea with my best friend and member of this forum danijrod and her hubby Johnny! Now I dare say seen as we are there for the majority of each other's holiday plus staying at the same resort this may not be the only time we see each other but we thought we best make an official meet up! We are heading to Wolfgang puck unless we are swayed elsewhere! We will hopefully have a little lie in this morning and head off to Disney Springs as previously mentioned I'm super excited about all the new shops etc down here and the food so much so that I managed to sneak an ADR in for Art Smiths Homecoming! I was going to wait until April to put this one in but with such high reviews I couldn't wait! Oops! We are heading to Animal Kingdom on the evening to take in the beautiful night-time entertainment I've made FP for Finding Nemo the Musical for the 4pm show (this will hopefully get swapped for Rivers of Light/Jungle Book shows), Kilimanjaro Safaris and Expedition Everest I'm really looking forward to taking all these new experiences in because photos look breathtaking! Early start this morning to head to magic Kingdom for an 8.30 ADR at Be Our Guest the view of walking up Main Street with hardly any people there is something everyone needs to see! We have FP for 7 Dwarfs Mine Train, Under the Sea and Space Mountain we have plans to head to Disney Springs tonight with a reservation at Portobello however I think this will probably be cancelled I'm just waiting for the final say from the family first but it will still be a Disney Springs night I have so many counter service places to eat! I'm leaving this morning open SHOCK HORROR! We have an ADR for Be our Guest Lunch but I'm not sure if we will keep it or not I think I might just try a wing it morning if that's possible! We have FP on the evening at EPCOT for Spaceship Earth and the new Frozen ride and Plain White T's are on Eat to the Beat so I would like to catch them if possible! Today is a Magic Kingdom day we are either heading to Be our Guest for Breakfast or Lunch but being the indecisive family we are we can't decide! Either way we have FP for Pirates of the Caribbean, Splash Mountain and 7 Dwarfs Mine Train we will be heading to Disney Springs on the night to hopefully tick off another eatery! EPCOT is on the cards this morning with FP for Character Spot, Soarin and Spaceship Earth on the afternoon we are heading to Disney Springs on the evening we loved Disney Springs last year so I can imagine it being a let-down this year! Our last full day (sad face) only one place for the last full day and that's Magic Kingdom we have FP for Pirates of the Caribbean, Haunted Mansion for me and mam and Peter Pans Flight for auntie and uncle and 7 Dwarfs Mine Train we also have the Be Our Guest Lunch we head to our second most happiest place of EPCOT to take in food and wine and say a final farewell until April! Check out day (sad face) we will hopefully try and get room until 1pm as it really helped us out last year we will get a taxi to Disney Springs to check in our baggage as on the way back we usually have more bags than hands making it difficult getting on and off magical express with said bags, Virgin who we travel with charge a very small fee to check in and they take your bags so once you get to the airport you just go straight through and honestly it was the best decision we made last year! Other than the actual flight which isn't until the evening we will probably just wander around get some food before the Tragical Express comes for us we fly back overnight and once we land in Manchester we will make the journey back up and back to reality! I look forward to sharing my experiences with you all and if anyone is around the same dates we are I'd love to try and meet up! Wow sounds awesome...and a great trip for sure. Sounds like a great well thought out plan. Sounds like a fabulous trip! Can't wait to hear what you think of Morimoto! More importantly I can't wait for your review of Homecoming as we have an ADR there in February! Me too! We have reservations for both at the end of January! Looking forward to both of them. Don't forget, ask for the middle section on Soarin' for the best views! I can't wait to see what you think of the night visit to AK!! It's amazing! The lions on safari are the best! Thanks we are super excited! Thanks! it's taken a while to get here the ammount of "swapsies" for this trip have been unreal! I think I'm finally done! I will be sure to come back with reviews for both we are all really excited about these places! get yourself down! we are joined at the hip at home we thought we may aswell be joined in another country! I've made a note to ask for the middle! I'm not risking not having an amazing ride! It's your pictures that have me so excited! 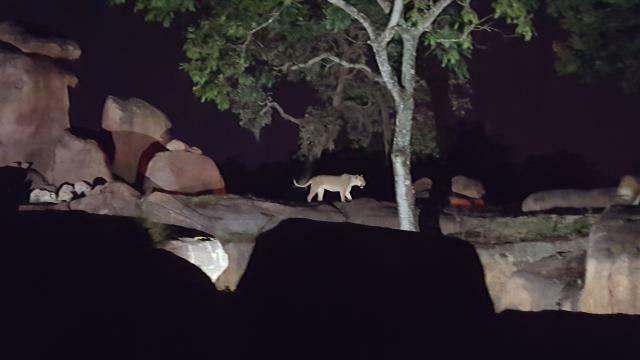 I want to ride EE in the dark and hopefully see the lions on the safari I cant wait is it time to go yet?! I did the safari right after the last Lion King show, so it was around 8:45 when I got on. 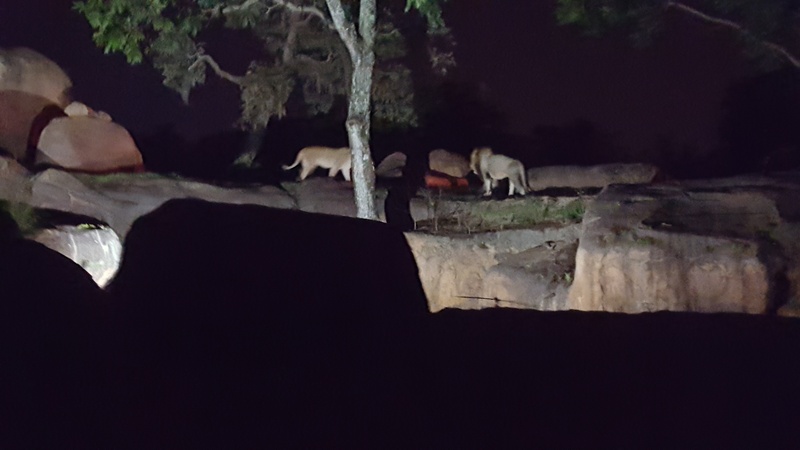 You can see the outlines of the animals and some of them up close but the lights on the lions is just bright enough to see them really well. wow those pictures look awesome!! I cant wait to see it in real life!! so exciting! !